My 18-year old son is an accomplished magician, and started to get into magic around the age of eight--and if you talk to professional magicians, you'll find most of them because interested in magic at around that age. Because of this, I am always intrigued by new children's books featuring kid magicians, particularly those featuring "regular kids", i.e. not of the Harry Potter variety. The Vanishing Coin is the first volume of a promising new series for those just getting into chapter books (i.e. of the Magic Treehouse/Junie B. Jones difficulty level). This book features an awkward fourth grader named Mike, who seems to suffer from ADHD (but no talk about meds in this book). His parents have made him quit soccer so he can focus more on school work, but staying on task is an endless struggle for him. Is there anything that he's good at? When he and his neighbor Nora (who's annoyingly good at everything) discover a dusty old magic store, complete with a colorful owner (shades of Bruce Coville's Magic Shop series), Mike feels an instant connection--and discovers that he's really good at magic tricks. Will this help him fit in in 4th grade and even deal with the school bully? Because the book is co-written by a magician, Mike Lane, it includes directions to do actual magic tricks discussed in the book--i.e. the reader can learn tricks right along with Mike. This is very appealing for young readers--combining the best of a chapter book and a to-do-magic book. The book is abundantly illustrated with appealing cartoon-style drawings by illustrator Eric Wight, author and illustrator of the Frankie Pickle series. 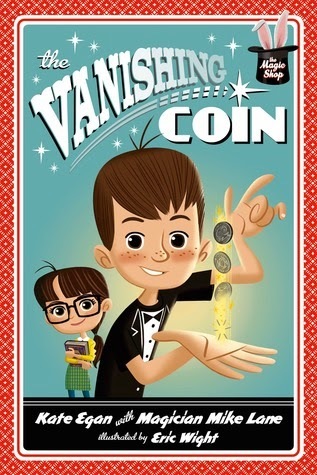 The first in a series, The Vanishing Coin should be appealing to both boys and girls, particularly those who identify with a character trying to find his place in the world and feel "special." Volume 2, The Incredible Twisting Arm, is already available as well. I'd love to see a great website to go along with this series, featuring links to sites of appropriate magicians, magic tricks, magic history, etc.